In the 2005-2006 season, the season after North Carolina won its previous national championship, not much was expected. All that happened was North Carolina having a surprisingly good year and Roy Williams doing perhaps his best job ever as coach. Unfortunately for Tar Heel fans, this season isn’t shaping up to be quite as successful. The Tarheels are struggling in every since of the word right now. They are losers of three of its last four including a blowout loss at Clemson and a road loss at the College of Charleston. They are 12-6 right now and their RPI is in the 50’s. The Michigan St and Ohio St wins will go a long way for them, but if they don’t turn it around soon, this season can spiral out of control. The main reason North Carolina is in this position is because Ty Lawson plays for the Denver Nuggets. North Carolina is solid in the frontcourt, but guard play is holding it back. If they’re able to get solid play out of Larry Drew, this team can be dangerous in March. 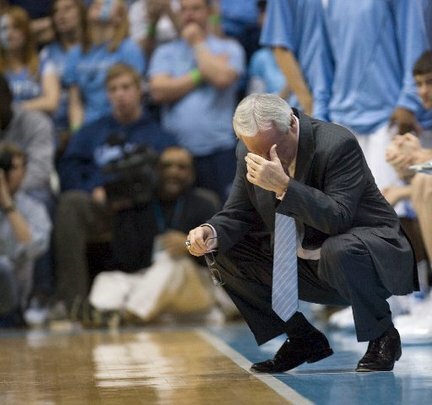 Right now though, its just not looking good for Roy Williams. Stock Up: Ohio State. This is a completely different team with Evan Turner. As you saw by the show he put on in West Lafayette, Ind. last week, he’s clearly an All-American. In a foul-plagued game against Wisconsin, Turner still managed to score 15. This team might be too far behind Michigan St to catch the Spartans for the Big Ten regular season title. However, at full strength, this very well may be the best team in the conference. Stock Down: UConn. The Huskies are very much in the same boat as the Tarheels, except they aren’t the defending national champions and preseason favorites to win their conference. That being said, they are reeling. They haven’t been the same since Georgetown rallied to beat them and with Texas on its way, it could get worse before it gets better. Stock Up: BYU. The Cougars continue to be the top program in the Mountain West. They were expected to win the conference again, but they way they’re playing it looks like no one else is going to have a shot. At 17-1, the Cougars are in complete control at it appears that they’re going to sail to another NCAA tournament berth. Stock Down: Coastal Carolina. The Chanticleers are having the best year they’ve had in years, but they had an opportunity to send a message to the rest of the Big South last week and failed. The Radford Highlanders went into the Chanticleers building at took their lunch. Although the Coastal is still a game ahead, no one is going to put their money on it over Radford to win the Big South.